Owning and driving a car comes with a unique set of challenges and risks. There’s nothing like the convenience of being able to reach long-distance destinations or hop over to the store, but when your car breaks down or you get in an accident, the struggle can be pretty painful. Like most technology, cars are incredible when they’re working and pretty awful when they aren’t! Oftentimes, people get focused on major car issues as their main risks, but at the end of the day, it’s the little things that can have a big impact. We’re locksmiths, so it’s easy to guess the topic we’re headed for: locking yourself out of your car. Nobody expects to leave their car without keys to get back in. Pretty much every single person our locksmith team has helped back into his or her car felt like everything was under control. It was only when the person needed to get back into the car and could not that disbelief set in (followed by dismay). Whether it is your first time getting locked out or you can’t stop doing it on the regular, there’s never a good time for it. 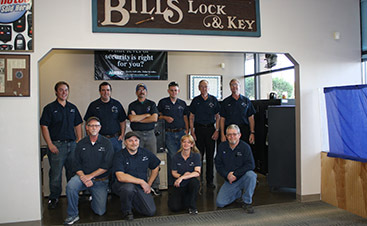 You need an Albuquerque locksmith who can quickly help you out and get you on your way. But what if you could avoid getting locked out in the first place? 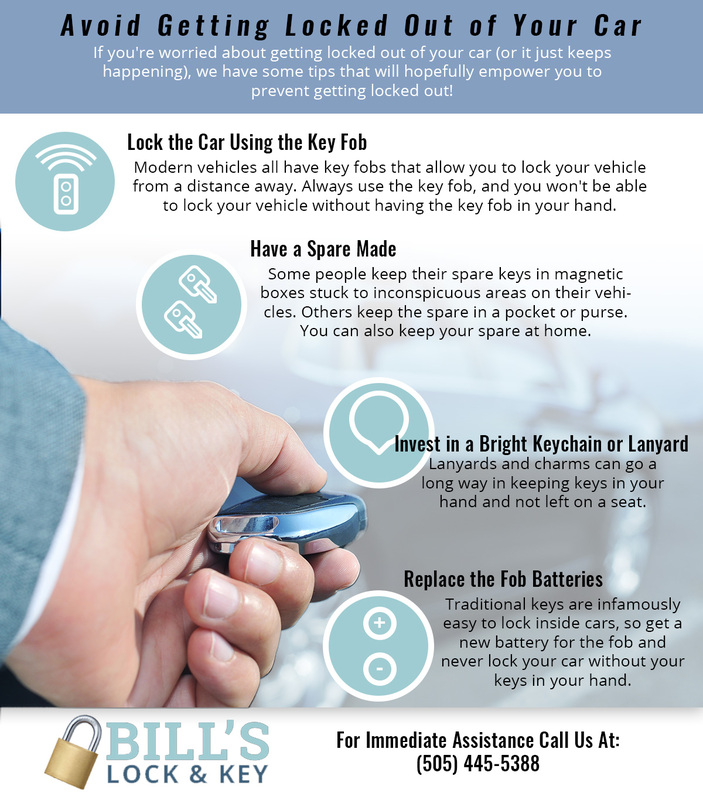 If you’re worried about getting locked out of your car (or it just keeps happening), we have some tips that will hopefully empower you to prevent getting locked out! Modern vehicles all have key fobs that allow you to lock your vehicle from a distance away. Some people have the habit of hitting the lock button on the doors before shutting them. Unfortunately, locking a car this way makes it really easy to leave the keys inside. Instead, always use the key fob. That way, you won’t be able to lock your vehicle without having the key fob on you. Depending on what kind of keys you have and how expensive spares will be, making yourself a spare or two can be a good idea. A normal key without a fob can be easily replicated at a hardware store, and your car dealership will be able to give you spare fobs. 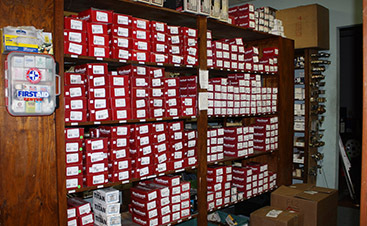 Once you have your spares, it’s time to decide where to put them. Some people keep their spare keys in magnetic boxes stuck to inconspicuous areas on their vehicles. Others keep the spare in a pocket or purse. You can also keep your spare at home. If your keys are always on you when you leave your car, they cannot ever be locked inside. Most times, people lose their keys inside their cars when they set them on a seat. Keep your keys in your hand with the help of a colorful item. Lanyards and charms can go a long way in keeping items as small as keys on your radar. If you remembered to grab your keys but the fob isn’t unlocking your vehicle, chances are good the battery is low. While some key fobs are attached to traditional keys, don’t fall into the trap of just using the traditional key because the fob is dead. Traditional keys are infamously easy to lock inside the car. Instead, head to an auto part store and get a new battery for the fob so that you never lock your car without having your keys in your hand. Chaos is a normal part of daily life, and even the most organized person can end up losing track of important items like car keys. 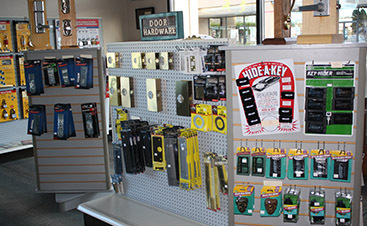 If you find yourself locked out of your vehicle in Albuquerque, contact our expert team of dependable, trustworthy locksmiths.